November is approaching and that means Fantastic Beasts: The Crimes of Grindelwald. On Wednesday, June 31, 2018 we got a little glimpse of what may be coming our way with the release of the Screenplay book cover. The book cover was released on Pottermore and it is giving us some spoilers on what we can expect to see. You can clearly see the Eiffel Tower in this image, which means it is going to be a significant location in the movie. 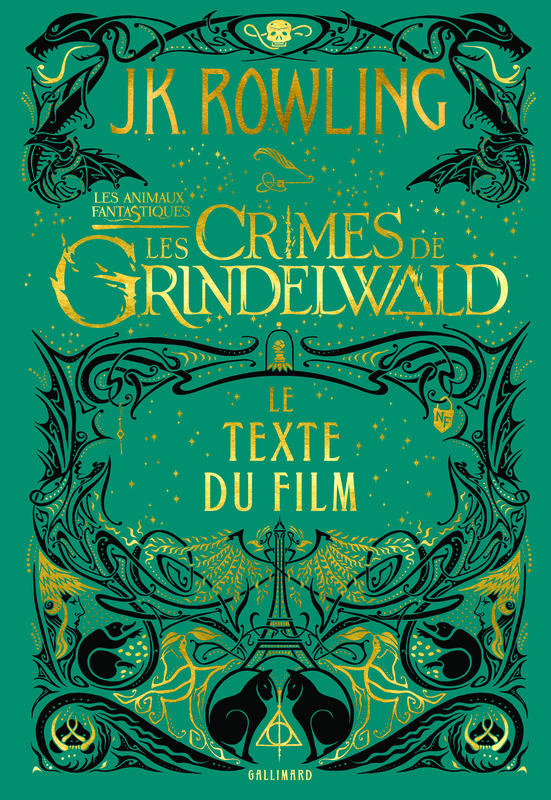 Just underneath the Eiffel Tower you see two cats looking down at the Deathly Hollow Symbol, which we know both Dumbledore and Grindelwald are fascinated about. This isn’t the only location of the Deathly Hallows though. Two items of the Deathly Hallows is shown in the title as well. The I in “Crimes” is the The Elder Wand; and the A in “Grindelwald” symbolizes the cloak of invisibility. Right below title is what appears to the the Philosopher’s Stone in a case, with a lock to the right of it that says NF, which stands for Nicolas Flamel, and a key to the left of the Stone. There is so much more hiding in this cover, so let me know what else you see! There is something else really well hidden in this picture that I don’t think a lot of people have noticed yet. Leave a comment saying what you think it is.